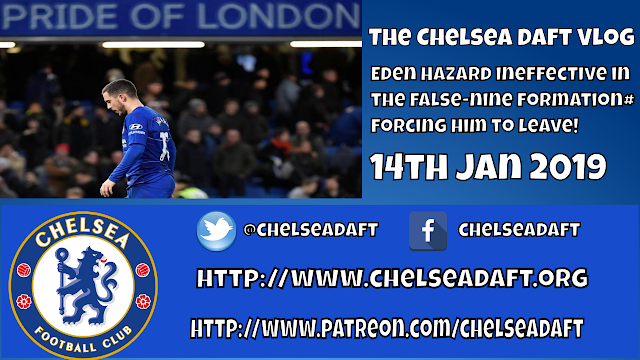 In today's Vlog I focus on the struggle to beat Newcastle, my take on Eden Hazard and the false-nine formation, Chelsea Ladies, Cesc Fabregas and the latest transfer rumours. Chelsea 2-1 Newcastle: Frustrating to see Sarri go with the false-nine against Newcastle (no disrespect). Chelsea need to play with a focal point and I could not understand why if he is fit to be on the bench, why Olivier Giroud never started. Eden Hazard was isolated, ineffective and was eventually substituted. I tweeted at half-time that if he was playing wide left and off of Giroud, he would have dictated the show. The false-nine does not work long-term and against the big teams we will get beat as we lack fire-power and potency. David Luiz calls for Chelsea to kill teams off. Chelsea Ladies beat Arsenal and blow the title race wide open. Michy Batshuayi to join Fabregas at Monaco on six-month loan deal. Gonzalo Higuain wants to leave AC Milan - Why spend money on someone the same age as Fabregas when it was deemed that the Spaniard was too old to be given a longer term deal than a single year? Willian being touted as a potential suitor for China - big money offer rumoured to be happening. Maurizio Sarri - if we finish outside the top four he won't be here next season.